The Tree Company was set up by Bill Malin in the 1988 in the wake of the 1987 Hurricane, he is still the owner and continues to drive the company forward. In 1993 the company attained Approved Contractor status with the Arboricultural Association - the UK's leading professional body. Started in Twickenham, South West London The Tree Company quickly grew and moved to its present HQ in Hounslow where we have a large premises capable of storing and recycling all the wood and wood chip produced from out tree related operations. 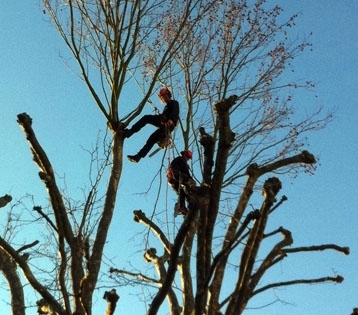 The Tree company takes an active role in continuing professional development (CPD). Our exemplary record of CPD is reinforced by internal and external training programs. The Tree Company, based in Hounslow, West London, offers Tree Surgery; Tree Consultancy; Tree Planting; and other related tree services. We provide high quality, competitively priced domestic and commercial tree surgery services, including general maintenance, felling, stump grinding, crown reduction, crown thinning, tree planting, bracing, and consultancy including insurance reports and BS5837 reports. The Tree Company offers a comprehensive planting service and can advise on the appropriate species for any given site from small domestic gardens to street environments and large development projects. Trees can be supplied and planted at competitive rates; we are also able to offer subsequent after-care on a monthly basis, or as required.